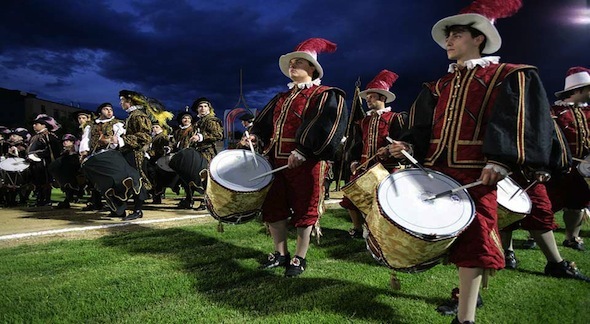 Foligno (PG) hosts every year the exciting Giostra della Quintana (Joust of the Quintana), ancient manifestation that has its roots in the local history of the city. The event revived in 1946 after a century break, keeping the traditional spirit of the part: it is inspired by the ancient equestrian competitions of the Medieval age. Perhaps, the origin of this competition is event more ancient, as its nome could suggests. The word Quintana is referring to the fifth street of the Roman military camp, where took place the training of the soldiers. Armed with lances, they hurled against a puppet, commonly called "Saracino" (Saracen), trying to skewer them on a suspended ring. During the Joust time, the city of Foligno is bringing back to the time to relive the glories of its medieval period, when women were "Dame" and men "Messeri". The real competition is accompanied by many spectacular ludic events and historical re-enactments, from the taverns to the entertainment and the historical parade. Find out more about the characteristic of the Joust and the related events! 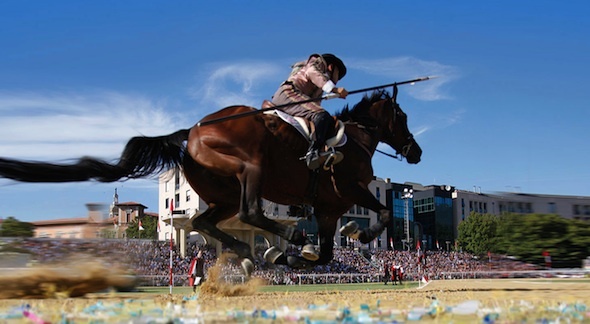 The Joust of Quintana is one of the best known and most popular horse races in Italy. In fact it is called also "Olympic Equestrian competitions". Ten riders will represent the ten districts of the city, and on this occasion they will take on a "fake name": the Ammaniti's knight is "The Vigorous", Badia "The Bold", Cassero "The Pertinacious", "The Furious" for Contrastanga, "The Faithful" Croce Bianca, "The Spirited" Giotti, "The Generous" La Mora, "The Bold" Morlupo, "The Black" Pugilli and "The Audacious" Spada. They will compete in armor riding a horse, in order to skewer the fateful 9 rings, 3 for each round. At each turn, the size of the rings will change from 10 cm to 8 cm and then to 6 cm. The rider who will manage to make the highest score will be the winner of the Joust of Quintana and he will be awarded after the competition to the "Campo de li Giochi". The Joust of Quintana has two different competitions: the first one is held in June and it is called La Sfida (The Challange). The second one takes place on Sunday in September and it is called "La Rivincita" ("The Rematch"). As we told you before, the Quintana is not only a competition. In the previous days, the city of Foligno will host many related events: entertainment for children, treasure hunt, thematic meetings, official trials of the race, tamburines challenge... and also the typical taverns, that will be open for all the days of the manifestation. 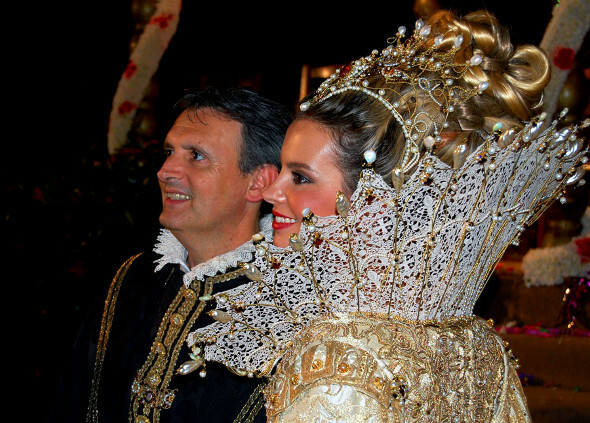 The peak of the event will be in the last weekend, the one of the Joust: the previous evening, a magnificent historical parade of about 600 figures will go through the streets of the city center, characterized by an impressive richness and care of the clothes. Then there will be a benediction of the horses that will compete the day after, when the challenge will be open by a triumphal entrance and a tamburine show. 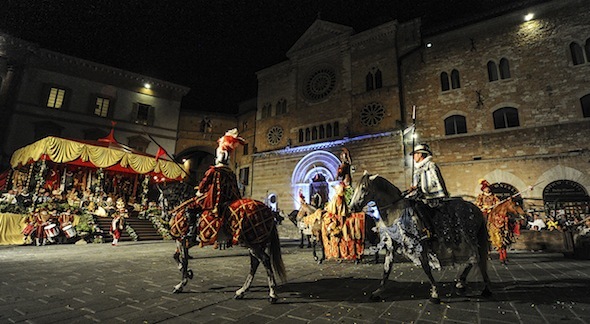 Enjoy the Joust of Quintana in Foligno!